After many years of deliberations and public hearings, the Department of Labor (DOL) is implementing a new fiduciary rule with regards financial advisors who represent plans covered by the Employee Retirement Income Security Act of 1974 (ERISA). The new DOL fiduciary rule requires all financial professionals associating with retirement plans or providing retirement planning guidance to be ethically and legally bound to fiduciary standards. The simple definition of fiduciary says that a fiduciary is a person to whom someone has given their utmost trust and confidence to protect and manage financial assets. The DOL fiduciary rule is going beyond the simple definition and going with a legal interpretation that defines fiduciary duty as acting in the best interest of the beneficiary without any self-dealing or conflict of interest. The fiduciary is assumed to have greater knowledge and expertise than the beneficiary and must always put the needs of the beneficiary first. —> An example is a stockbroker who sets aside all consideration of commissions when considering what investment is best for the client. Previously, the investment advice fiduciary standards of ERISA were enforceable under the standard of suitability. An investment recommendation that met the stated objective and needs of the client was appropriate. Commissions and fees paid to the financial advisor did not matter unless they were overly excessive. The problem with the suitability standard is that investors often paid unnecessary fees. These fees serve as a drag on investor returns. With more than $24 trillion in retirement assets including more than $7.5 trillion in Individual Retirement Accounts (IRAs), the extra fees are conservatively estimated to be more than $20 billion per year. 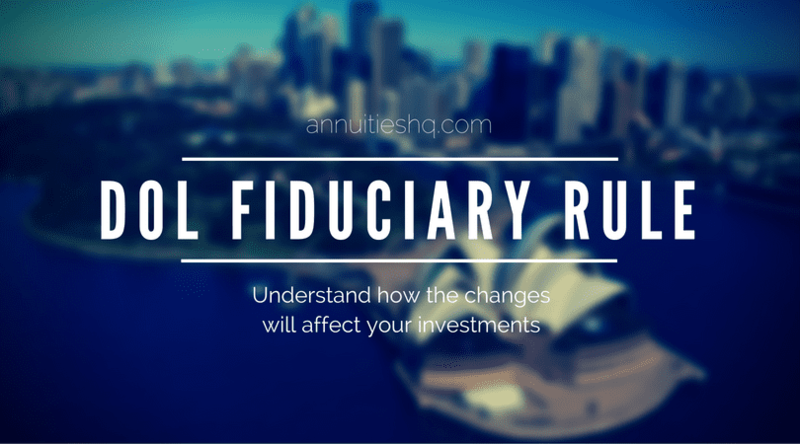 Does the new fiduciary rule apply to my investments? The DOL fiduciary rule applies to defined contribution plans including all 401(k) plans, Simplified Employee Pension (SEP) plans, savings incentive match plans (Simple IRA), employee stock ownership plans, and 403(b) plans. The new fiduciary standard also applies to all traditional defined benefit plans and IRAs. After-tax investments in standard brokerage are not part of the new Department of Labor rules. Registered Investment Advisors (RIA) and fee-only financial advisors will experience little change from the new fiduciary rule. However, securities brokers and insurance agents who receive the bulk of their compensation from commissions will be in a tough place in their new role as fiduciary advisors. Commission based products will still exist, but financial advisors will be required to obtain a signed Best Interest Contract Exemption (BICE) from their clients. The BICE is a statement on the client’s part that they understand all the details regarding the financial representative’s compensation. The financial advisor needs to fully disclose in plain language all forms of direct and indirect compensation. The investments hit hardest by the new DOL fiduciary rule are front-end loaded mutual funds, funds that have 12b-1 marketing fees, and some forms of annuities. Many brokerage firms that offer these kinds of plans are already adjusting their fees, and commission schedules to plans reward the longevity of investments in a fund at the expense of a broker’s upfront compensation. A few of the larger brokerage houses are eliminating all commission based retirement plan options except for self-directed investment accounts where the client is responsible for all investment decisions. Other firms plan on continuing with commission-based systems but will require all clients to sign a BICE and provide the clients with ongoing disclosure information. How Will the DOL Fiduciary Rule Affect Annuities? Insurance companies underwriting annuity products will need to make adjustments as these products normally pay upfront commissions. Some annuity plans have already been under fire for aggressive fee schedules. However, better run insurance companies have been making changes to annuities by lowering fee schedules and making voluntary disclosures to compete better with mutual funds. Specific new policies are coming that are a smoother fit with the new rules. The new policies are simplified only to include the best features that annuities have to offer such as portfolio protection, guaranteed returns, and potentially guaranteed income. Over time, annuities could become a much better investment option with this increase in transparency. The immediate winners from the implementation of the new DOL fiduciary rule are investors who need no hand holding from a financial advisor when making decisions. Potential losers are people who used to get free advice from brokers who earned commissions and now must pay advisory fees to learn about their options. Financial firms that rely on the commission and extra fee income to run a sales force will also take a short-term hit. The implementation of a streamlined and more ethical system will reward everybody with lower fees and better returns. Even the brokerage houses will eventually benefit from the increasing receipts of standard account fees earned on larger client account balances.